These glands produce thyroxin, a hormone that regulates the body’s metabolism. 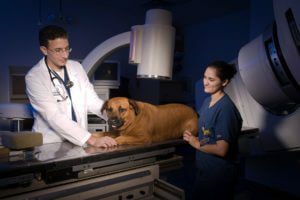 Thyroid tumors in dogs are relatively uncommon, but if seen, golden retrievers, beagles and boxers between the ages of 9 and 11 are most common to develop this tumor. These tumors are almost always malignant, meaning that they tend to spread to the lungs and lymph nodes and can grow into nearby structures such as the windpipe, blood vessels and esophagus. A complete blood count, chemistry profile and urine testing are completed in the initial stages of the evaluation of the patient that has a suspected thyroid tumor. Blood tests can be run to see if the thyroid glands are functioning normally or are hyperactive. A fine needle biopsy of the tumor provides a diagnosis about 50% of the time. Ultrasound of the neck frequently can show the extent of the tumor and may demonstrate spread of the tumor to lymph nodes in the neck. Chest X-rays are important to identify visible spread of tumor to the lungs. It is important to note that no imaging test can identify microscopic spread of cancer to the lungs and other internal organs. It has been estimated that only 25 to 50% of patients presenting with a thyroid tumor are candidates for surgery. Only tumors that are not attached to the underlying tissues in the neck should be removed. 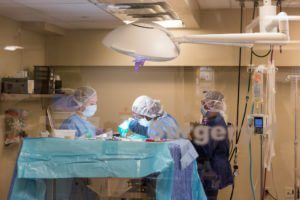 Surgery involves making an incision on the underside of the neck, separating the muscles that cover the thyroid gland and then removing the thyroid tumor. Both thyroid glands are inspected as some patients have tumors in both glands. Thyroid tumors tend to be moderately responsive to chemotherapy; therefore, there is value in this treatment modality. Unlike humans, most dogs receiving chemotherapy do not lose their hair and usually have only mild side effects, which may include transient loss of appetite and vomiting. Treatment with radioactive iodine can be successfully used to treat some thyroid tumors. Since this treatment requires a high dose of radioactive iodine, most hospitals do not offer this treatment due to staff safety concerns. 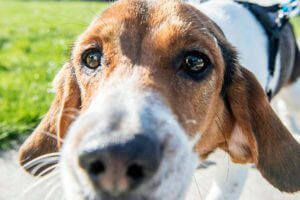 Another study that included 13 dogs with invasive thyroid carcinoma showed a median survival time of 96 weeks. Four dogs died of metastatic disease and four from progression of disease. It is concluded that radiation therapy is a better treatment modality than chemotherapy alone. Although the studies have not been published, chemotherapy combined with radiation therapy may be more beneficial than a single treatment modality.